CarGurus has 11,339 nationwide Escalade listings starting at $1,999. As iconic for Cadillac as the Corvette is for Chevrolet, the 2015 Escalade is redesigned and better than ever. Context is everything, though, and it sure seems like Cadillac is charging big money for a vehicle that doesn’t reflect the price paid. Image is also everything, and that’s why Cadillac dealers can’t get enough Escalades to sell. When you’re spending more than $75,000 on a new set of wheels, you’re choosing that vehicle for emotional rather than practical reasons. This is why I normally don’t review expensive, high-end models, because no matter what I have to say about them, you’re going to go ahead and buy them anyway, and I don’t like to waste my time. The 2015 Cadillac Escalade is a perfect example. In a recent interview with Automotive News, ex-General Motors executive Bob Lutz commented that if Cadillac dealers could get their hands on more new Escalades, they’d be selling lots more vehicles. Yet those same dealers struggle to put people into ATS and CTS models, two Cadillacs displaying arguably more merit than this big, dumb truck. There. I said it. The Escalade is silly. But, it’s also a pop-culture icon, and because it signifies success like no other American SUV can, the Escalade flies off showroom floors just as soon as it arrives from the Arlington, Texas, factory where it gets built. For this review, Cadillac loaned me a pimped-out Escalade Platinum, which tops a range of SUVs that starts at $73,965 and climbs to $95,345 with all the extras. Choose the long-wheelbase Escalade ESV model, which is necessary if you plan to carry more than 5 people and more than 15.2 cubic feet of cargo at the same time, and you’ll spend another three grand. Commanding a price that is $7,805 higher than the Escalade Premium, the Escalade Platinum is loaded with upgraded materials, including semi-aniline leather, sueded microfiber trim and headliner, special wood accents, and more. Open the door, and what I presume is the scent of luxury comes wafting out. Platinum models also have special 22-inch aluminum wheels with chrome spoke inserts, a unique grille treatment, and a small “P” badge on the tailgate to help onlookers identify it as the “best” Escalade. Big, bold, and badass, the Escalade’s styling certainly goes a long way toward ensuring its popularity. You can still tell that a Chevrolet Tahoe lurks beneath the Cadillac design cues, but thanks to clearly different front and rear styling treatments, it's harder to discern where the Chevy ends and where the Cadillac starts than it used to be. Inside, the Escalade is clearly differentiated from the Tahoe and GMC Yukon models with which it shares its underlying platform, architecture, and componentry. While the upgraded materials that are included with the Platinum trim certainly class up the joint, they also draw greater contrast between the high-end surfaces and the comparatively inexpensive plastics that Cadillac uses in various areas. While design is clearly one of the Escalade’s strongest selling points, the lack of interior refinement when it comes to the details—like how the cupholder cover sounds and feels when operated, or how the cheap plastic lid for the Platinum’s center console refrigerator looks and feels—Cadillac needs to make extra effort in order to justify a price tag of nearly $100,000. If someone asks you why you bought a Cadillac Escalade, don’t try to justify the purchase by using logic. You can’t even claim that you need to carry lots of cargo or tow lots of weight, because if that were true, you’d be driving a Lincoln Navigator, which can tote more stuff and handle more trailer than the Caddy. While the Navigator can tow more weight with its twin-turbocharged V6 engine, nothing sounds quite as good as a big, rumbling V8. 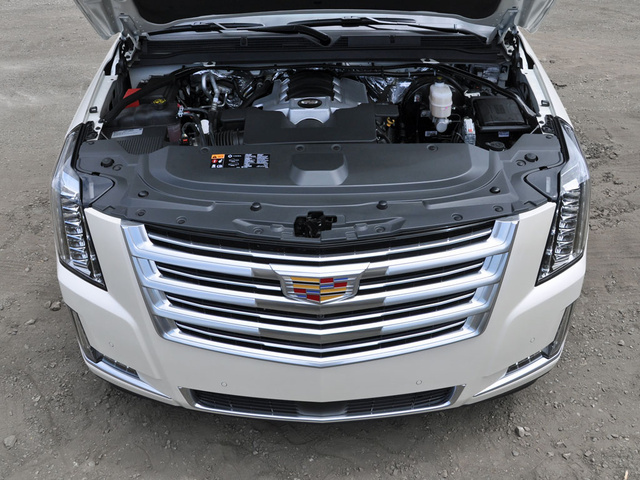 Cadillac installs a 6.2-liter V8 in the Escalade, one producing 420 horsepower and 460 lb-ft of torque, which allows the SUV to tow up to 8,300 pounds when properly configured. The engine is equipped with Active Fuel Management, a system that shuts off half the cylinders under certain driving conditions in order to maximize fuel economy. According to the EPA, my test truck should have gotten 17 mpg in combined driving, but I averaged 16.3 on my usual testing loop, a number that dropped to 15.1 mpg by the end of the week due to suburban kid shuttling and errand running. But hey, you’re super successful and very rich, so what do you care about gas mileage? Escalade Platinum models also have a magnetic-ride-control suspension, which continually adjusts to the road surface and offers the driver a choice between Tour and Sport driving modes. Sitting on 22-inch wheels wrapped in 285/45 tires, the Escalade Platinum rides like a horse-drawn cart. Yes, I purposely used the word cart instead of carriage. And in Sport mode, it might just knock your fillings loose. Although they utterly destroy the Escalade’s ride quality, those fat 22s give the towering SUV unexpectedly good grip in corners. If not for the fact that it feels as wide and tall as a semi truck from the driver’s seat, I’d almost be willing to call the Escalade tossable. That’s not true in traffic, though. When you’re driving something this big and heavy, an SUV that literally dwarves the vehicles driven by your fellow citizens, you need to take extra care. Here in Los Angeles, narrow freeway lanes are the norm, as city planners have continually sought to find ways to improve the flow of traffic. As such, I kept the Escalade’s lane-departure warning system on throughout my test, because a moment’s inattention could allow the SUV to wander too far afield from the selected lane. An Escalade is tough to drive in Southern California’s cramped parking lots and municipal garages, too. Like our freeway lanes, parking spaces are tight, and while the Escalade fits in the ones that are not marked “Compact,” once you’ve crammed it between two other vehicles, it's very hard to get out of the SUV, especially if you need to unload little kids from child safety seats. Don’t worry, Texas. I know America is full of wide-open places with big giant spaces. Given the number of Escalades I see running around urban centers, though, it's worth pointing out that piloting something this large can quickly become a pain in the you-know-what, even if Cadillac installs a Surround Vision camera system in every one it builds. Bob Lutz, in that same Automotive News interview I referenced earlier, is a guy with inside knowledge of how things work. He said that GM is reaping huge profits on its big SUVs, which are marked up far beyond the cost of production. The obvious disparity between the Escalade Platinum’s upscale surface materials and the rather inexpensive approach to foundational elements of the cabin certainly lends validity to such statements. A dust and fingerprint magnet, the standard Cadillac User Experience (CUE) infotainment system sure doesn’t help to impart quality. The black plastic used for the control panel occasionally creaks under pressure, as do the controls on the Escalade’s steering wheel. And when I drove the Escalade with the third-row seat folded down, an incessant rattle originated from behind my right shoulder each time I traveled over the tiniest of bumps. Unfortunately, if you want to carry much more than a few grocery sacks or a compact folding stroller, you need to keep the third-row seat folded. That expands cargo capacity from 15.2 to 51.6 cubic feet, the latter figure measuring 2.2 cubes larger than a Mercedes-Benz GL-Class, but falling short of a Navigator by 2.8 cubes. Don’t worry about needing that third-row seat, though, because adults will “unfriend” you on Facebook if you force them to ride in the Escalade’s cramped rearmost accommodations. Kids fit, but as the Insurance Institute for Highway Safety has pointed out, the safest spot for children is in the second-row seat. The Escalade Platinum can carry exactly two children in this location, because it has captain’s chairs with a giant, gaping space between them. 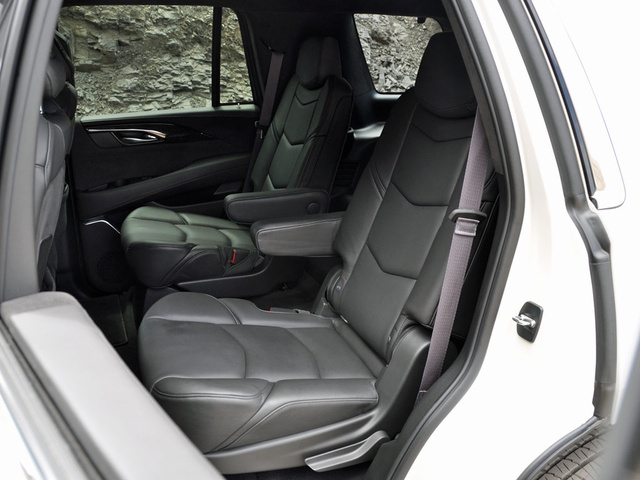 The captain’s chairs do not slide to help maximize space, which some adults might find unexpectedly snug given the Escalade’s gargantuan exterior dimensions, and they do not move in toward the middle of the vehicle, placing kids in the safest possible location within the SUV. Fold them down to create 94.2 cubic feet of cargo room, which amounts to half a cubic foot of extra space compared to a Mercedes-Benz GL-Class, but comes up short of the Navigator by 9.1 cubes. Front-seat comfort is exceptional, the ventilated front seats working wonders during a California heat wave. 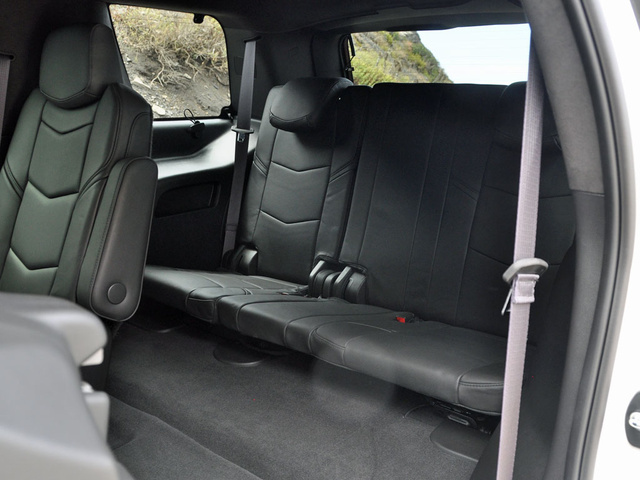 Both the driver and the passenger can inflate a number of different bolsters within the seats to tailor their fit to specific body types, and my test vehicle’s driver’s seat also included several types of massage functions. One thing to note about the Escalade, whether you’re riding up front or in the back, is that the power retractable side steps are a pricey option. Skip them and you’ll wish you hadn’t, because otherwise it's tough to climb into and jump out of this truck. As far as interior controls are concerned, Cadillac attempts to dazzle Escalade buyers with its CUE infotainment system. The proximity sensing, haptic feedback, gesture recognition touch panel sure looks slick, and with practice it gets easier to use. However, practice and familiarity also mean that the user is able to execute commands faster, and CUE regularly exhibits laggardly response. It sure would be nice to have a few traditional knobs and buttons, especially for commonly used functions. With CUE comes a long list of high-tech equipment, including an OnStar 4G LTE Wi-Fi connection, wireless inductive smartphone charging, voice-recognition technology, an SD card slot, and no fewer than 5 USB ports. In the Escalade, CUE is paired with a standard Bose Centerpoint premium Surround Sound audio system. Additional standard equipment includes Surround Vision, four cameras that provide a 360-degree view around the SUV in order to make it easier to maneuver, a feature that is definitely necessary for this vehicle. A 12-inch configurable instrument cluster display is also included on every Escalade and communicates a broad range of information to the driver. Depending on which version of the Escalade you buy, it can be equipped with a configurable heads-up display, Intellibeam headlights that automatically switch to high-beam lights to improve forward illumination, and a rear-seat entertainment system. Platinum models have all these features, plus additional viewing screens embedded into the front-seat headrests in order to support independent media choices. 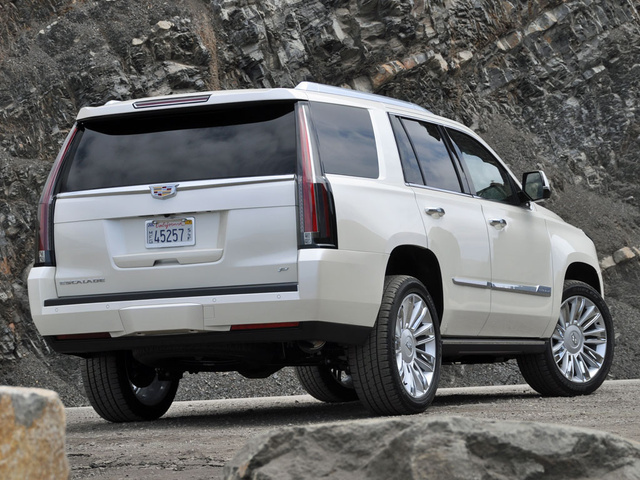 A Cadillac Escalade weighs a minimum of 5,594 pounds, making it heavier than most other vehicles on the road. Plus, it sits up high on a truck-tough frame. Chances are, unless you’re colliding with another full-size SUV or a semi truck, the Escalade will protect you better than it will the occupant(s) of the other vehicle. With that said, crash testing results are inconclusive. The Insurance Institute for Highway Safety (IIHS) has not rated the Escalade, and the federal government gives the Escalade a 5-star rating for side-impact protection but no rating for frontal-impact protection. The one evaluation worth noting is the rollover resistance test, for which the top-heavy Escalade earns just 3 stars. 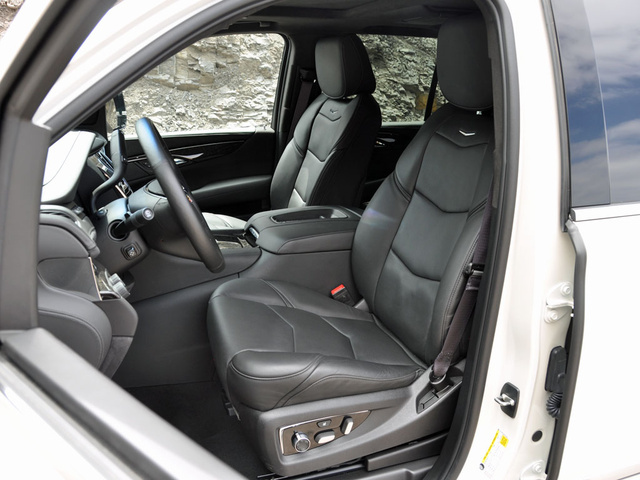 Standard safety equipment includes a reversing camera, a front center airbag designed to protect against crash forces originating on the opposite side of the SUV, and a free year of OnStar Directions and Connections service with automatic crash response and stolen-vehicle assistance. A Driver Awareness Package is included in Luxury, Premium, and Platinum versions of the Escalade, bundling together forward-collision and lane-departure warning systems with a Safety Alert seat design that vibrates to notify the driver of a threat. The three trims also have a blind-spot warning system with lane change and rear cross-traffic alert systems. A Driver Assist Package is included for Premium and Platinum trims, equipping the SUV with an adaptive cruise control system with automatic collision preparation, automatic safety-belt tightening, and automatic front and rear braking. Cadillac’s safety net of technologies is comforting, especially given how difficult it can sometimes be to drive the Escalade. If you’re shopping for an Escalade, this section of this review is likely irrelevant to you, because if you were concerned about how cost-effective this Caddy is, you probably wouldn’t be shopping for one in the first place. Although it's more fuel-efficient than ever, the 26-gallon fuel tank drains rapidly, and I had traveled just 260 miles before the gas gauge read a quarter tank with 110 miles of range remaining. The Escalade’s unquenchable thirst is just one of many reasons that Consumer Reports predicts that the costs associated with ownership are high, despite a 4-star depreciation rating from ALG. 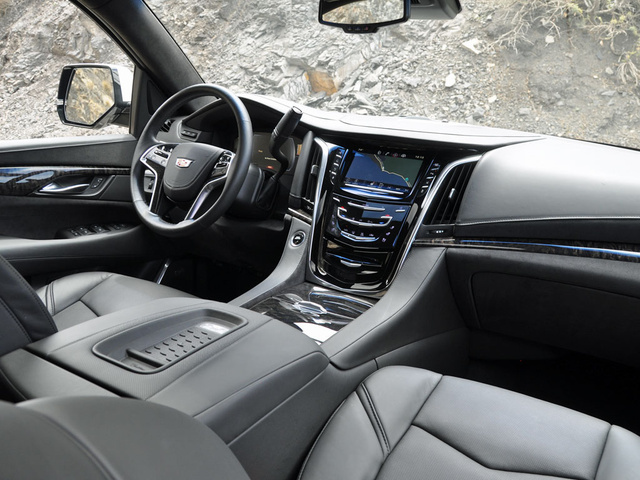 While the previous-generation version of the Escalade performed well in terms of reliability and dependability, recently redesigned Cadillacs have not fared well on this front, in part due to user confusion over the CUE infotainment system. In fact, in the latest J.D. Power quality and vehicle appeal surveys, the new Escalade received the lowest Power Circle Ratings from the company. Cadillac isn’t offering deals on the Escalade, though. Hell, it can barely keep up with demand in the first place, selling every single one it builds. A lease deal for the Escalade Premium with 2-wheel drive requires you to write a check for $4,879 up front, and then pay $999 per month for three years. You can drive no more than 30,000 miles, or 833 miles per month. If you currently lease a GM product, Cadillac gives you $750 toward a lease on the Escalade. That’s a pittance, really—almost an insult. Like I explained at the beginning of this review: You are going to buy an Escalade no matter what I say. From a practical perspective, this Cadillac makes very little sense. Just do yourself one big favor and pay the $3,000 premium for the Escalade ESV, especially if you plan to haul kids in the third-row seat. 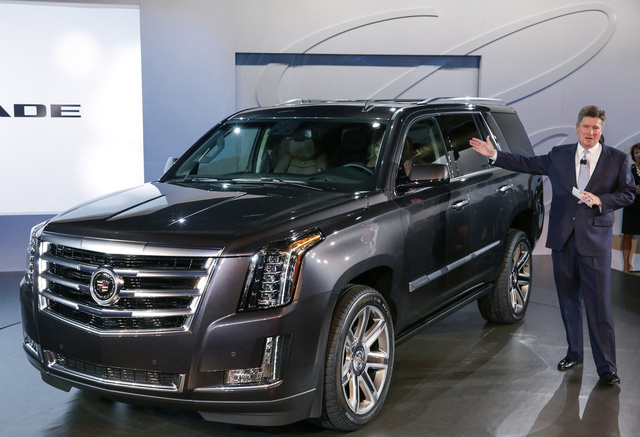 What's your take on the 2015 Cadillac Escalade? 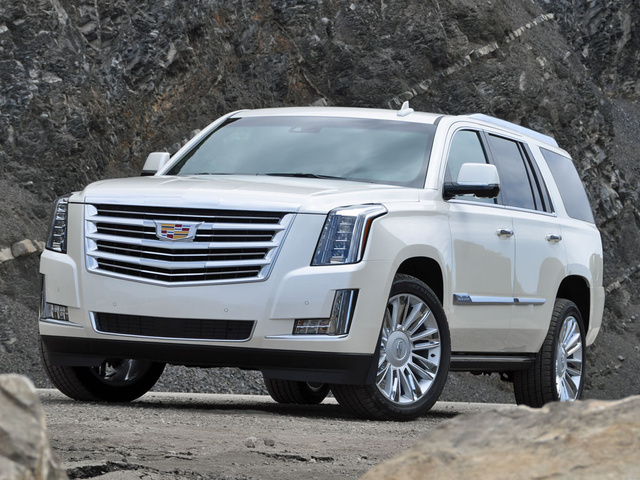 Users ranked 2015 Cadillac Escalade against other cars which they drove/owned. Each ranking was based on 9 categories. Here is the summary of top rankings. Have you driven a 2015 Cadillac Escalade? Should I give salesman my vehicle payoff amount before he gives me tradein amount? How do you select between tour verses sport modes?